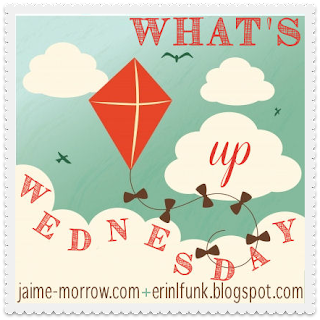 What's Up Wednesday is a weekly blog hop hosted by Jaime Morrow and Erin Funk in the hopes of bringing writers together on our crazy journeys. If you're interested in finding out more about this blog hop and/or joining us you can read more about it here! WHAT I'M READING: I'm still working my way through Game of Thrones (I think I can. I think I can.) I am also reading, and hopefully finishing today, Numbers by Rachel Ward. It's a pretty interesting read. I wouldn't say it is going to become my new favorite, but so far I've really enjoyed it. I love first person narration from sarcastic characters. WHAT I'M WRITING: I added 1,147 words to The Homecoming Court yesterday, which is super impressive considering I spent literally the entire day watching Nintendo's E3 live stream so I only ended up writing for a little under an hour. I have a goal of writing at least another 1,000 today and I'd like to finish up the character bio for Erin. I'm getting close to the actual competition starting and I'm super excited to start writing the crazier scenes! WHAT INSPIRES ME RIGHT NOW: I've been following the twitter conversations (primarily tweets by Maureen Johnson; if you're not following her you're doing twitter wrong my friend) about the subtle sexism and not-so-subtle condescension in the recent articles about John Green and how he has apparently "saved" the YA genre (note that I adore John Green and know that he has been openly speaking out against these implications). I am loving seeing so many writers and readers coming together to tell the world that YA does not need saving and that it is a legitimate and widely diverse genre that anyone should be proud to read and write. It has made me even more excited about finishing up my own novel so that someday I might join the list of YA authors that I love so much. Long live YA! WHAT ELSE I'VE BEEN UP TO: My new blog launched this week! The Pop Cultist is officially up and running and I'm so excited! You can check it out here! I also went to see The Fault In Our Stars last Thursday and it is amazing; I highly recommend it. I also highly recommend you bring tissues and lots of them. And last but not least I spent all day yesterday watching the Nintendo E3 live stream and fangirling over all the new games coming out in the next year. It is going to be a good year for Nintendo fans, and a bad year for my bank account. You can read my top 5 highlights from the showcase on my other blog: here! The narrative the media has spun around John Green being this savior of YA is so gross. And it's not John Green's fault at all. I totally picture him cringing or just looking at his wife with sad eyes every time another article pops up, because I'm sure it feels crappy to him too. :( But it is nice to see awesome lady authors speaking out about it. Congrats on launching your new blog! It has been very frustrating and he has tweeted in frustration over it more than once. It has also come up in a few of his live streams. Its just bad media all around. I'm happy to see so many people speaking out against it though. I've been following Maureen Johnson for a long time- she's awesome on Twitter! I can't wait to see TFiOS. I think I'll need to take sunglasses or something to hide my red puffy eyes when the movie is over. I loved TFiOS and Ron's quote fits perfectly. I love it, but I suffered watching it. I got in my car and played sad music and cried. The movie was a great representation of the book! Good job on your writing!